How to make the risk of starting your own business doable. I used to have a full-time job with benefits with a very prestigious university. I later quit to pursue my own business. However, it wasn’t so cut and dry. There were (and still are) a lot of layers to pursuing a dream of working for myself. This process can also spark some ideas for you to realistically take the risk too. It may even help ease some of your fears and concerns preventing you from taking the leap. Here’s my story that began about 10 years ago. For the first time in my career as a college career adviser, my creativity was being stifled under new leadership. I was also experiencing a lot of micromanagement under this new leadership. I couldn’t continue to work under both conditions and had to start planning an exit strategy. At first, this strategy wasn’t to quit my day job. I started where most people start, looking for another job working for someone else doing the same thing elsewhere. Of course I wouldn’t leave my current job until I found my next job. But, I never found the right fit. Instead, I found opportunities that only served as an escape from my current situation. Not opportunities I could truly thrive in. Next, I started listening to what my friends were telling me. They kept telling me I would be good at wardrobe styling. This was something I’d been daydreaming about for a long time. Wardrobe styling would definitely provide a creative outlet for me. Specifically, I branded myself as an image consultant for up-and-coming recording artists here in Nashville. I knew there were a lot of young artists moving to town and taking the risk to pursue music. I also knew they lacked the ability to properly present themselves to a label (which is basically a job interview) or in a media interview (I’d also had some past experience in media coaching too). I worked on my branding efforts part-time while still working my day job as a career adviser. Following my own advice to my students, I also spent my spare hours networking with the few contacts I had in the music industry and growing my network. For nine months I did this and my efforts began to pay off. I slowly began getting clients. I worked with those few clients on weekends, evenings, and any time I had off from my full-time job. However, I still wasn’t hasty in my exit from my day job. Instead of giving two weeks’ notice, I gave 30 days’ notice because the policy was I could work for the university again in the future if I gave 30 days’ notice. But not if I’d only given two weeks’ notice. I wanted to keep as many options open in case things didn’t work out. Once I was on my own, I was already getting used to working for myself and there wasn’t as much to fear as I would if I’d left my day job and then started a business. This isn’t to say I had no fear at all. A few days before giving my notice at my day job, I experienced my first (and luckily my only) panic attack. Then, when the economy tanked in October 2008, less than two months after I’d left my day job, I started to get nervous. But, what I saw happening all around me was people being forced into becoming their own boss with no real planning or preparation. I was way ahead in that department because I’d already been preparing for nearly a year. And I already had some clients. Throughout my time as an image consultant I continually made connections through networking which turned into additional ways to supplement my income with my growing business. While attending a fashion show, I met the president of a small design college who hired me to teach a class on image at the college for a semester. He also ended up publishing the 2nd edition of my first bestselling book, Advance Your Image, through the school’s small publishing company. While attending an event at the Entrepreneur Center here in Nashville, I met someone who needed a contract employee with career advising experience to do outplacement counseling for his clients. I still do this work to this day because I get to make my own schedule and it’s the complete opposite of micromanaged work. I love it. The connections I’d made through my original day job led to a part-time (10 hours/week) temporary job at another university, which unexpectedly turned into a part-time permanent position. After leaving that part-time job, I realized I was burned out on seven years of image consulting and wanted to do something different. But what? I had no idea. I just knew I didn’t want to risk all the work I’d put into developing my brand. Then a year and a half later I realized I still wanted to do career advising, but this time on my terms. (Click here for the story on how this realization came about.) I still wanted to be my own boss. And I wanted to keep the same name from my image consulting business. I was able to do both with a slight shift in my mission and an overhaul of my services. Now, I offer unique career coaching services focusing on helping people discover and pursue their own passions. This includes helping them either find a new day job they’ve been daydreaming about, or helping them take the steps (not the leap) to becoming an independent freelancer or business owner. Whichever they’re most passionate about. My business became more successful once I was willing to make this change. I was also able to see how the experience I gained and the tools I developed in my image consulting business fit nicely with my new mission and offerings. Today, I don’t have to supplement my income anymore. Now, I get to do it simply for the love of the variety in my schedule and the love of the creativity it brings me. Unfortunately my time only lets me do one additional gig to my full-time daydream. But I’ve never been happier in my work. No one is micromanaging me or stifling my creativity. I get to choose who I take on as clients and which projects I want to invest my free time into. I started setting goals and then taking small steps toward achieving those goals. You can do this too with the on-demand program Don’t Just Set Goals, ACHIEVE Them. It’s the same plan I created for myself that can be easily adapted by anyone regardless of their own goals, passions, or daydreams. You can also get the complimentary hand out for the program when you subscribe to my newsletter at www.howtoachievemygoals.com. Bottom Line: You may want to pursue your daydream as your own boss but think it’s impossible. 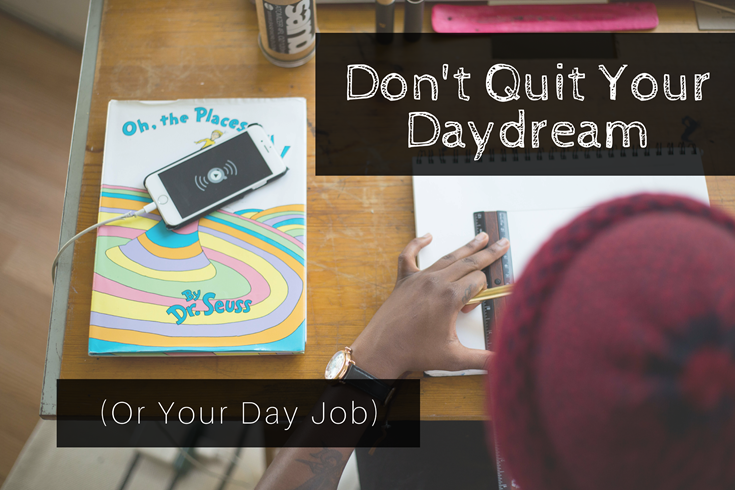 And it may be impossible for you if you simply quit your day job to follow your daydream. I want to serve as one of several examples of how doing it with an alternative, less-risky strategy can make it possible even for you. Probably more so than you ever imagined. If you liked this article, please click the 💚 to recommend and share it with others! Originally published at www.yourpassioninlife.com on May 16, 2017.